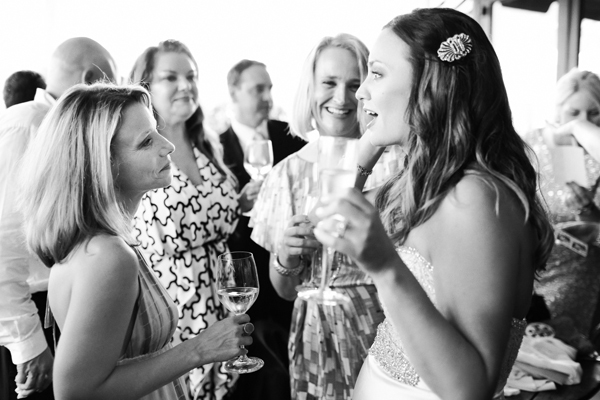 Negative Comments You Just Might Hear – About YOUR Wedding! Ever been faced with a wedding comment that was so inappropriate it left you tongue-tied? Among the congratulations and well-wishing, you’re bound to hear a few remarks that are rude, annoying, or flat-out appalling. Be prepared and you’ll leave them sputtering. Translation: Coming from an unmarried acquaintance, this sort of question is likely a projection of their own fears — they’re not in a position to make a lifelong commitment, so it’s hard to imagine that you could be. Translation: Whether it’s a reflection of their own marriage problems or a past incident that convinced them monogamy is impossible, this person has a knack for souring good news. Quick comeback: It’s easy to get seriously offended by this one, but take the high road and try cheesy humor. Ask if their favorite precious stone is “jaded” or whether they hit any traffic on the Pessimist Expressway that morning. Translation: Any engagement over a year might seem excessive to some, but it takes a lot of time to pull everything together. The person’s comment may be out of surprise, not ill will. Quick comeback: You have a few acceptable options: Explain that the best wedding vendors are booked more than a year in advance, that you’re extending the engagement to save more money, or that you have something you want to accomplish (finish your degree, settle into a new job) before you make your marriage official. Translation: While you and your fiance have probably discussed getting engaged for a while, the news might be a shock to some. The person who says this doubts you’ll have enough time to plan a nice wedding. Quick comeback: Reassure them that though your engagement is brief, you set the wedding planning wheels in motion well before he popped the question. Be calm — if you seem too swept up in the excitement of the proposal, it supports the idea that you’re rushing things. Translation: Almost any engagement ring can elicit a snide remark, whether it’s too big, too small, too sparkly, or not sparkly enough. This sort of nastiness undoubtedly stems from jealously that you’ve been proposed to, and the ring is an object that provides an outlet for them to concentrate all their envious feelings on. Translation: While it’s a cliche for a bridesmaid to gripe about the dress, it still happens. If she’s strapped for cash, her disapproval may be in hopes that you’ll pick something less expensive. Or she could really think it’s hideous. Quick comeback: Find out why she doesn’t like it and try to locate some middle ground. Suggest that she stick with the dress color but then let her choose her own silhouette. Translation: Imitation is the sincerest form of flattery, but it’s aggravating when a friend steals a unique wedding idea. Take it as a compliment that your ideas are so great; then steer your friend in a new direction. Quick comeback: Agree the idea would work well in your friend’s wedding, but suggest she personalize it to better fit her style. Encourage some brainstorming and change an element of the concept so it’s similar but not identical. Translation: Maybe they’re surprised by all of the nice details you’ve included in your wedding, or perhaps they’re wondering how your parents could afford to host such a great party on their own dime. Either way, this one ranks near the very top of the bad etiquette list. Translation: No need to decipher this one — this person simply wants to attend the party. Tactless on their part, sure, but don’t be surprised when an annoying coworker, excitable neighbor, or wayward cousin asks for an invite. Quick comeback: Rather than postpone the awkwardness with a dodgy line like, “We haven’t finalized the list yet,” tell them that, due to a tight budget, you’re keeping things intimate and the guest list will be mostly close family. Translation: This can be interpreted in a few ways. If the person is planning their own wedding, they’re probably asking out of genuine interest because they like what you’re doing. If, however, there’s no chance they’re planning their nuptials, odds are whatever you tell them will garner an obnoxious response. Translation: Some people think that it’s fine to tack on a “plus one” to any wedding invite. Though it’s definitely a wedding etiquette faux pas, you should give your guest the benefit of the doubt and chalk it up to an innocent misunderstanding rather than a snobby “I don’t go anywhere without a date” attitude. Translation: They want the world (or at least the reception) to know how proud they are you tied the knot. And a minute in the spotlight satisfies any extrovert tendencies they might have. Quick comeback: Say that you’re flattered by the offer, but you want to keep the toasts to a minimum — just the parents and honor attendants. If a close family member really wants to speak, you should consider letting them say a few words at the rehearsal dinner. Translation: The joy of a wedding leaves some people overly enthusiastic about the next huge life event: starting a family. Curiosity about baby plans is natural — most people keep those thoughts to themselves, while others prove to be significantly less reserved.